The Islabikes Luath 700 Small is among the smallest and therefore easiest to access full-sized 700C-wheel road bike available on the market. It's testament to the consistent quality of the bikes produced by former British national champion/medallist (mountain biking, cyclo-cross, grass track, track, road...) Isla Rowntree's Islabikes brand that the name is as well known as any manufacturer of adult bikes. From striding/balance bikes, through to a myriad wheel sizes, frame shapes and transmission styles, the extensive range guides young riders from toddler to adulthood. Key to success has been Isla's determination to make 'real bikes for kids', not those bike shaped, candy coloured confections that populate department stores and can rot a child's passion to ride before it's even begun. The heart of the Luath is the 7075 T6 alloy frame, with relatively small diameter butted alloy tubes, each tidily Tig welded together to form a semi-compact shape frame. 'Semi-compact' means the top tube gets lower from the head tube to the seat tube, giving better standover (crotch) clearance when stood astride the top tube. Especially handy if the rider is only just tall enough to get on. The frame is mated to a steel fork with a sloping crown. While the trend in adult bikes will be for vibration-damping carbon forks, on grounds of price and durability Islabikes opts for steel, but the narrow diameter blades still ensure a smooth ride. The fork comes with mudguard eyelets at the dropouts and low-rider rack mounts on the legs – this is a bike for all seasons and all kinds of road (and even some off road) riding, and for the options they bring come with practically zero weight penalty. The overall look is svelte and minimalist, helped by a healthy layer of metallic paint – in our case a two-tone lime green (an orangey red is the other option). It certainly seemed to go down very well with the testers, who liked the head-turning that the colour caused. The seatstays are braced twice, once for the standard brace and once for the cantilever brake cable stop, and we wonder why it's necessary, especially on kids' bikes where power output is considerably less than an adult's bike; combining them would save weight and clean up the look, with no loss of strength (note: kids' bikes have to pass the same EN strength tests as adult bikes, which is why most are disproportionately heavy). It would probably help soften the ride as well. Same goes for chainstay bracing (incidentally, Scott doesn't brace the chainstays on its 24in-wheeled Speedster road bike). 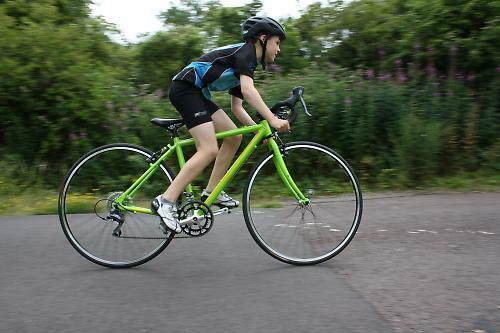 The 8-speed transmission comes, as seems to be the norm on junior road bikes, from Shimano. 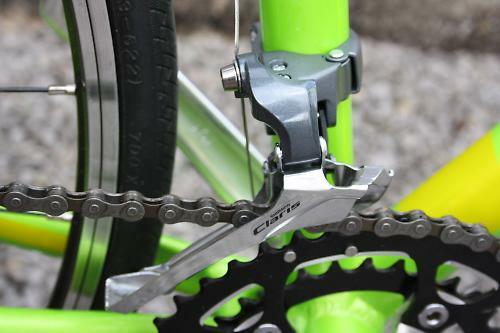 The combined brake/shift levers and derailleurs are from its well-regarded Claris groupset. 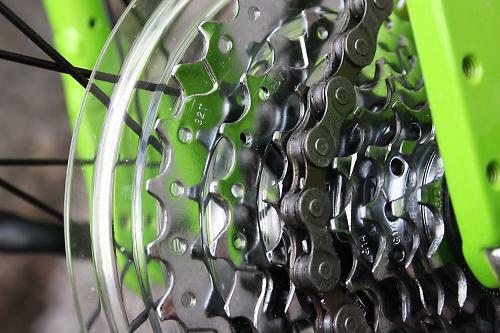 The crankset is a cold-forged alloy unit with 36/46-tooth chainrings, with a SRAM 11-32t cassette. The stylish polished silver alloy 165mm cranks turn on a square taper Shimano bottom bracket. The KMC chain flicks cleanly across the sprockets, as you'd expect from Shimano, and our experience tells us that even with this entry-level groupset the shifting, if well maintained, will be crisp for a long time to come. The Tektro Oryx cantilever brakes work well with the Claris levers and equally with the matching Tektro secondary 'cross-top style two-finger levers – a sensible choice for a bike that can easily perform double duty as a winter/cyclo-cross bike. The clearance for bigger cyclo-cross ready tyres and a bunch of mud and leaves is ample. Fit is always going to be one of the things you'll have to adjust as the rider grows, but the starting point is good. A narrow and shallow-drop bar and a 60mm flip-flop Ahead style stem suit a growing youngster and allow a relatively flat back (hey, even kids want to get like Cav in the sprints) without compromising access to the controls. The seatpost is a dual-bolt, inline alloy model. There is a smidge of set-back in the clamp, but not much. 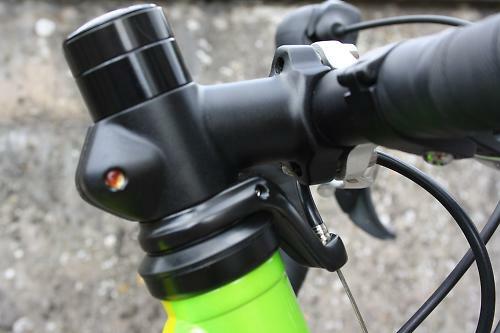 As the rider grows, be sure to adjust the length of the bike with some more rear throw on a replacement seatpost in addition to adding millimetres with a new stem, as much of their new height will be in the femur, which means they'll want to be a bit further behind the cranks for optimum pedalling action. Rubbish wheels can kill the ride of a lovely bike. Thankfully, you don't get that here. The rims are Islabikes-branded double-wall alloy numbers, black anodised with machined sidewalls and integrated wear-indicator groove. 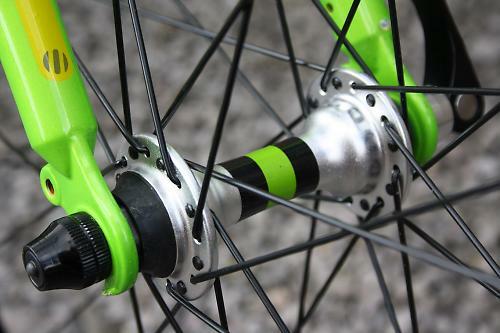 The 32 spokes front and rear are laced tightly to Islabikes-branded alloy, quick release, sealed-bearing hubs. The hubs are smooth and should, with care, last ages. 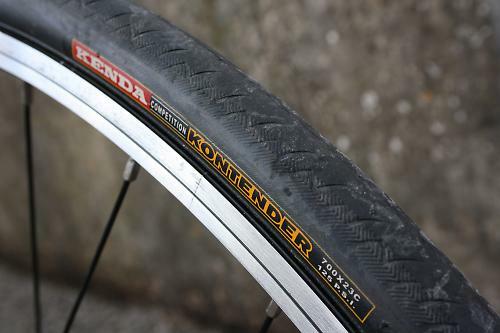 The 23mm Kenda Kontenders are lightly treaded and lightweight all-purpose tyres that will grip the road pretty well all year round, but we'd like to see 25mm tyres on this bike for a triple whammy win of no loss of speed, increased grip, control and rim protection. Okay, a quad whammy. Put it this way, I've had to dig deep to keep up with this green mean machine. Testers felt the ride was sporty and responsive, 'not like I expect a cross bike to feel like' was a call I remember hearing. The Luath changes direction easily, responding to a light touch, without feeling fly-away or skittish – just what young riders need in a fast road bike. Descending seems to be a particular penchant of the Luath, gobbling up sweeping turns with an appetite only beaten by that of the growing rider. We put this down to good geometry, a relatively compact cockpit, a fork that gives the front end a planted feel, and grippy Kenda tyres. Whatever the exact formula, it works. We did ride it off-road, even on the supplied road tyres, and we reckon that with a change of rubber it will make a tidy option for winter mud-fun. Does it have a weak-spot? Not really, though climbing was, on balance, the bike's least-best talent. That said, it's no slouch winching up steep Cotswold climbs effectively, and, as we all know, it's not about the bike. If you've diligently brought your child up on Islabikes as they've grown from toddler to pre-teen, the switch to 700C wheels should give you no reason to stray from the Midlands based brand. The Luath 700 Small is a great first taste of the senior wheel size. Young riders tall enough to handle 700C wheels but who need the smallest possible frame. 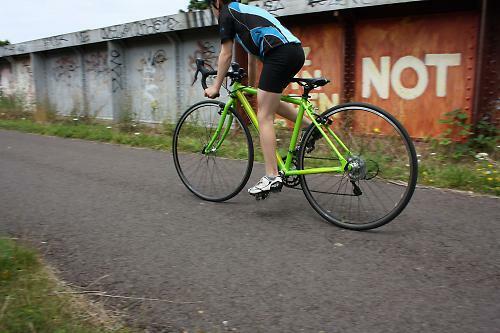 Islabikes says: "It's a perfectly proportioned bike for cyclocross, road riding, touring or triathlon." Islabikes has nailed this remit effectively. The Luath (Small) is designed to squeeze the smallest compact alloy frame around conventional (adult sized) 700C wheels in a way that allows youngsters to enter the 'big wheel' league at the earliest possible opportunity. All welds are neat and tidy, detailing is good with lots of rack and mudguard mounts, good clearances for cyclo-cross tyres and mud. We'd like to see the seatstay bridge and cable guide bridge amalgamated, for cleaner lines, less weight and hopefully a little more comfort. The bike performed exactly as advertised. For a jack of all trades machine, built to a price, the Luath impressed with speed, agility and general handling. 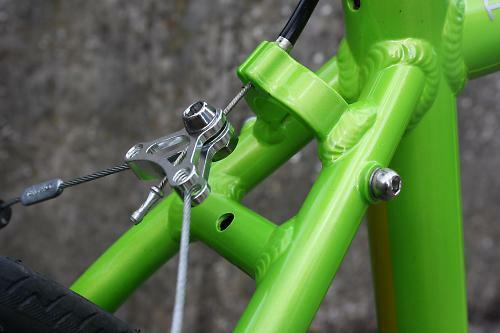 There is weight to be save on the Luath - the cassette, seatpost, stem, bar, fork and transmission can all be made lighter as parts wear out/funds accrue/interest in gong faster increases. The Luath is comfortable, though we think it could be better with less rear bracing, larger volume tyres (25 or 28mm) and eventually the addition of a carbon fork. You're getting everything you need here to start your 700C road bike career. The Luath performed perfectly. No complaints. The proportional cockpit sizing worked well, secondary brake levers are well loved by rider at this stage of their road riding career. Did you enjoy using the product? Very much so. The bike pretty much nailed its target, with only a few very minor niggles, so it scores highly. Wouldn't a 26" bike make more sense for small riders? Islabikes make 24" and 26" wheeled Luath models too. Check the size guide or give them a call to establish which is best. £550 for a kids bike? 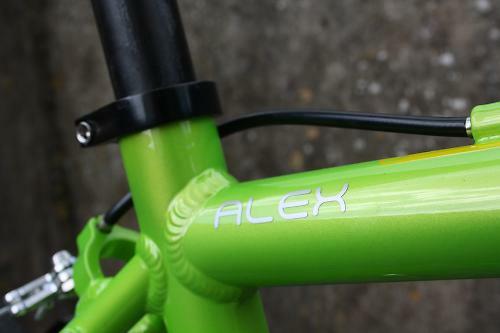 It sounds a lot but the cost of design, components etc is the same as an adult bike. At least with Islabikes resale value is incredibly high. Unlike many parents I know, if I thought my child would get good use from it, I'd spend my money on this rather than a PS4 or an iPad (or a fancy car) any day. I looked hard at the Luath for my 11 year old (they do indeed have great resale values) but for what you get for the money I just don't think they are good value. but the smaller ones "S" and below come with a 650b wheel and I wanted to be able to swap wheels around with the various ones I've got. 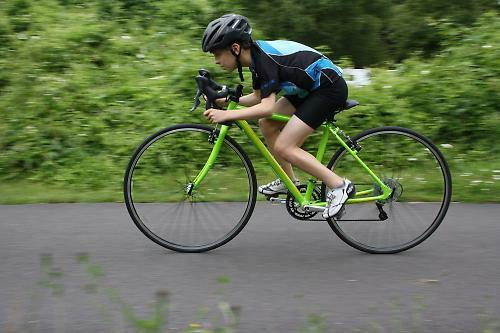 In the end went with the Boardman Junior Sport/e. Normally £300 which is a good price for a bike with very similar spec to the Luath but in my lads opinion better looking. Then Halfords went and had 15% off Boardman the other week and I then got another 10% off as a BC member so ended up paying £225 which I thought was a bargin. My eldest (aged 9) has the same bike, same colour, but in the 26 inch wheel size. Islabikes aren't cheap but they are light for their size and many of the parts are specifically sized for the kids who will be riding them and made just for Islabikes (e.g. 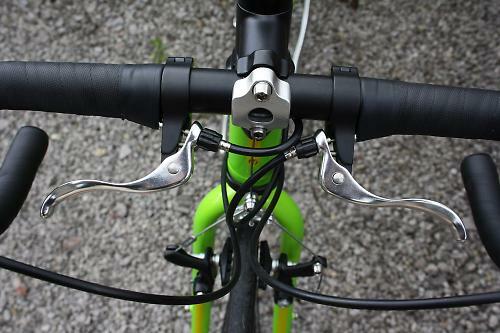 narrow grips for small hands, short cranks on smaller sizes, short stem). The Luath (particularly in the 24 and 26 inch versions) is a staple at cyclocross races as, unlike the Boardman, it has clearance for nobbly tyres. Once you get into the 700c large size then the kids will fit an adult bike and there is more choice and probably more budget model / brands available. Islabikes also stock replacement parts for all of their models and I don't know how true this is of other kids' bike manufacturers. For example another kids crashed into my youngest bike on holiday and damaged his chainset but we were able to buy another kids sized one for £30 or so from Islabikes. 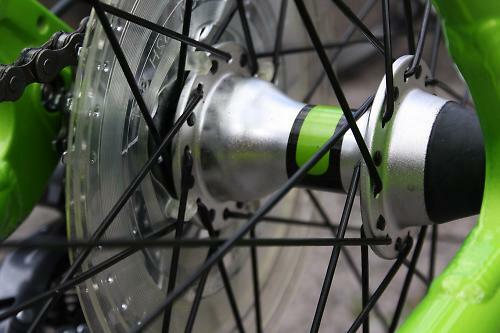 One thing to be aware of with non 700c wheels is that there are several standards for wheel sizes which are often called the same thing and it is not unknown for bikes to be sold with tyres in sizes that it is very difficult to find replacements for. It's nice that they make one in a junior size but for what they are offering you can get some rather nice lugged steel second hand. The very small sizes are quite hard to sell on so they come up at some belting prices.